Homepage. This page: Re-touched colour photograph used by this car manufacturer to advertise their latest saloon. Les sent this image in, from his collection of motoring artwork. 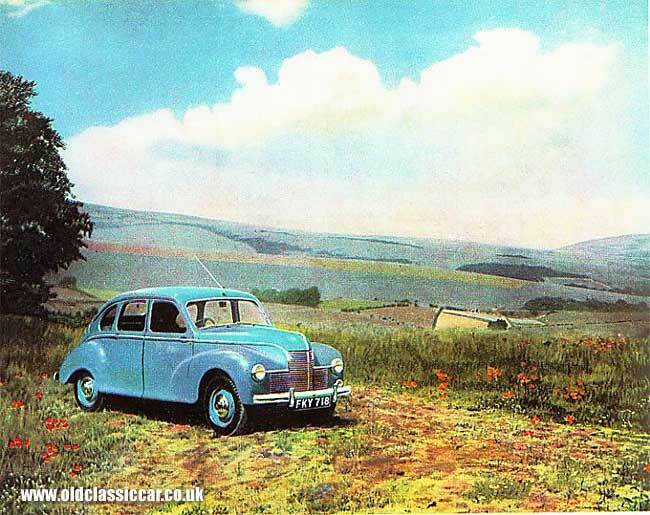 The re-worked photo below features the Jowett Javelin saloon, parked in the corner of a field. I imagine this photograph would have been used in period advertising for these Jowett cars, either in a brochure or maybe in some magazine advertising. 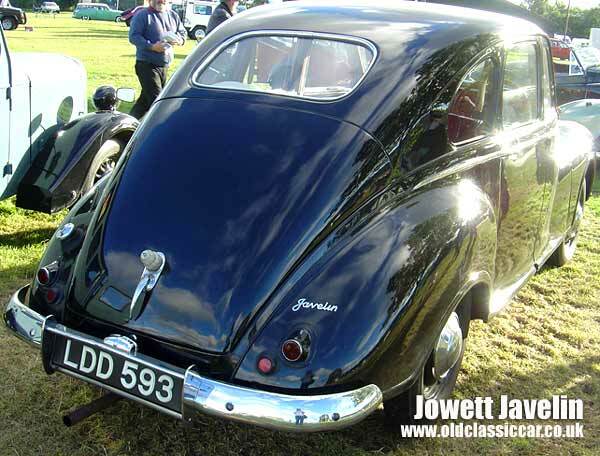 What is the Jowett Javelin? The Javelin was introduced by this Yorkshire-based company in 1947, and it was a bang-up-to-date design, when many car makers were still churning out warmed-over models that first saw light of day prior to the war. For its day, the rakishly styled Javelin featured many modern features, not least its streamlined styling (gone were separate wings and upright grille). Suspension was by torsion bar, and steering came via a precise rack and pinion layout (the Morris Minor would feature this superior steering mechanism when it came out the following year). Early Javelins had a hydraulic/mechanical braking system, with full hydraulics coming along in 1952, just a year before production came to an end, in '53. The Jowett car factory was located in Bradford, Yorkshire, at a time when most manufacturers were located around the midlands (Coventry for example). Gerald Palmer is credited as being the chief designer of this particular car, which was available as either a base, or 'de luxe', version. Most car makers in the postwar years stuck with 'safe' 4 cylinder, overhead valve engines, for their bread & butter saloons. Jowett however liked to do things differently. Their new car for 1947 came with a flat 4 (ohv) engine of 1486cc, with aluminium block (Austin, Morris and the rest were still using pre-war designed, all-iron, engines at the time). A healthy 50+ bhp was the result, and gave the Javelin a very useful turn of speed. Top speed was 77mph, aided by the car's smooth coachwork and sloping windscreen. The car had an integrated chassis, also quite unusual for the day, with independent suspension on all four corners. The overall length was 14', and width 5'. Two vintage images showing a Jowett Javelin overseas can be see on the Javelin page within the vintage photos section of this site.